We have some useful information for Minecraft Pocket Edition players now. One of the developers at Mojang has confirmed that the highly anticipated Minecraft PE 0.12.0 release date will not be in July and will instead be out in August. 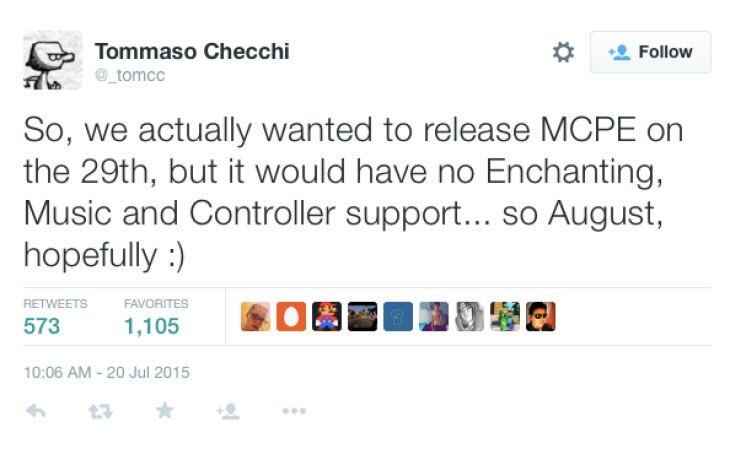 Tommaso Checchi has confirmed this on his Twitter account, revealing that the team had initially planned to go live on July 29. However if they did, the 0.12.0 build would not have the Enchantment table, music and controller support so this is the reason why they will now release in August. There’s no set date yet, but most of you should be happy now that a release has been scheduled officially by the developers. Hopefully the team will be able to get the next version out in the beginning of August, but it depends on how difficult it is to get the three above areas into Minecraft PE with minimal bugs. Are you happy that Minecraft PE 0.12.0 for Android and iOS is now coming for sure in August, or disappointed that it didn’t make a July release? As always we’ll keep you updated with the release if anything changes from now until next month.